At seventeen years of age Mr. E.C. Nicholls was a fully accredited local preacher in Wisbech Circuit. Removing to Heywood in 1879 he attended the morning school at Bridge Street the first Sunday, and became a teacher. 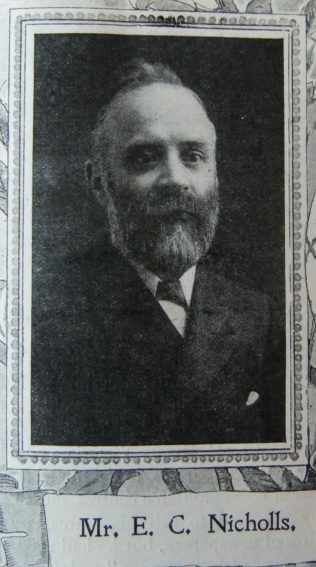 Superintendent for the last eighteen years, after a term as Society Steward he was appointed Circuit Steward in 1883, when Heywood became a circuit. No circuit could have a better Chancellor. Accounts are paid when due; his books are in perfect order for the auditors in the Quarterly Meeting. During his Chancellorship of twenty-five years he has only missed one Quarterly Meeting. Twice he has represented the Manchester District in Conference. He is President of the Local Free Church Council. His quarter of a century’s service will be suitably recognised in June, and during the same week Mr. and Mrs. Nicholls will celebrate their silver wedding. May their golden wedding still find them happy and vigorous. Edward was born abt 1860 at Wisbech, Cambridgeshire. His father was a mariner. Edward was a merchant tailor. Edward married Jane Kershaw (1857-1932) in the spring of 1883 at Heywood, Lancashire. Census returns identify two of three children. Edward died on 10 December 1927 at Heywood, Lancashire.